Both houseflies and gnats are two-winged insects, unlike most other species of insect that have four wings. One of the most common insect home invaders is the housefly, although some species of gnat also are common. 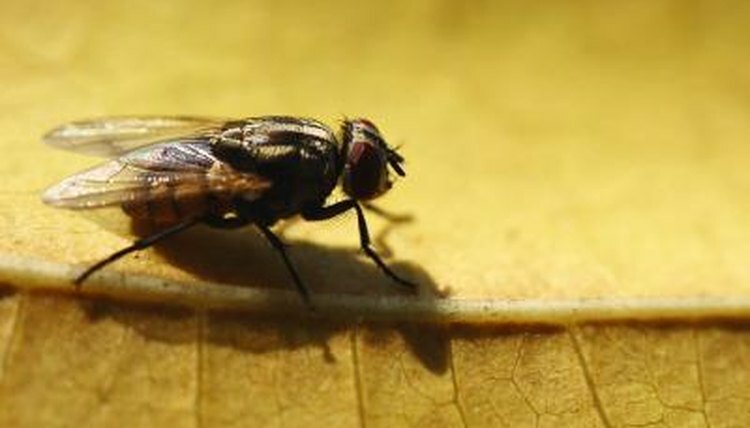 Houseflies are a single species called Musca domestica. Gnats are a common name for small flies and consist of several species. Two common gnats are fungus gnats and biting midges. Houseflies are approximately one-eighth to one-quarter inch in length. These flies have four dark stripes on top of the middle section of their bodies. The appearance of gnats varies by species, but generally, they are much smaller flies with long legs. Adults are commonly encountered in large swarms, especially near moist environments and at dusk. For example, fungus gnats reach one-eighth of an inch in length and their wings are characterized by a Y-shaped pattern. Houseflies are known disease transmitters and may be responsible for transmitting up to 65 diseases to humans. Some of these include anthrax, typhoid fever, leprosy and tuberculosis. They do not bite humans, but rather transmit disease through feces. Gnats do not transmit disease to humans. One type of gnat, the biting midge, is a bloodsucker and is known to transmit bluetongue virus to livestock, which can be deadly. Both houseflies and gnats undergo a complete metamorphosis. Females lay eggs that hatch into larvae. The larvae then pupate and emerge as adult flies and gnats. Houseflies lay eggs in conditions of decay such as horse manure, garbage or grass clippings. Maggots are houseflies in the larvae stage of life. They feed on the decaying matter in the area where they hatched. Within two days of emerging from the pupa stage, adults begin to mate. The life cycle of a housefly is normally three weeks long, but can be as long as three months in cooler temperatures. The life cycle of gnats varies by species. The life span of a fungus gnat, for example, is only three to four weeks, with adults living seven to 10 days. Larvae of the species feed on the fungus and decaying plant matter in the top layers of soil. To control housefly populations, keep the environment in and around your home clean. Remove and seal any decaying matter, including food and grass clippings. Use screens to cover your doors and windows to prevent flies from entering the house and consider using sticky fly traps or a fly swatter to capture or kill flies in your home. Chemical insecticides also may be used, but may cause a danger to children and pets in your home. Controlling the population of adult gnats is difficult. It is easier and more effective to target gnats in the egg and larvae stage. Gnats prefer moist environments, so allowing soil of household plants to dry between watering will help control fungus gnat populations. Since moisture levels outdoors are more difficult to control, especially around streams and lakes, consider using a DEET or natural bug repellent. Insecticides may be effective, but should be used with caution as they are poisonous to humans and may contaminate water sources if used outside. In addition, yellow sticky cards will attract and trap gnats.